The 500-plus-unit project planned for the prominent corner of 23rd and Union is the first apartment development in Seattle to use a local community ownership model for 20 percent of the units. Hoping to slow the displacement of residents from Seattle’s historically black Central District, local community groups are trying a new approach: teaming with developers to co-own a new apartment project affordable to low-income renters. 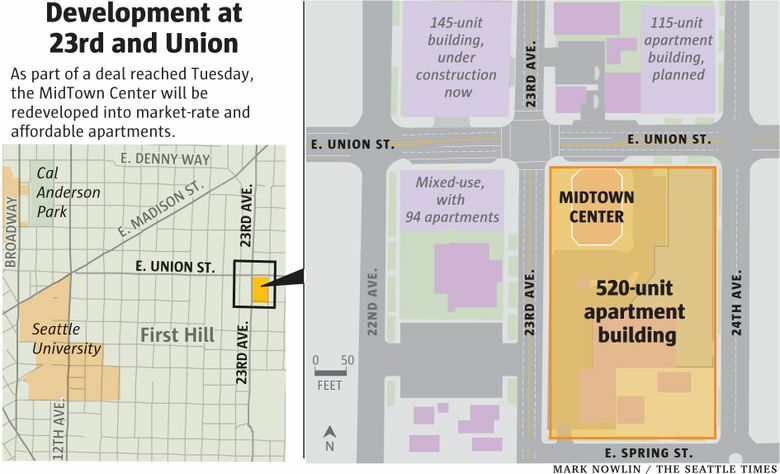 The housing will be at the pivotal intersection of 23rd and Union in the Central District. Once a focal point for the local civil-rights movement, popular soul-food restaurants and live-music venues, the block now anchors a majority-white neighborhood that’s become known for protests against gentrification by both white and black residents. A huge opportunity to shape the area surfaced a couple years ago, when a full block ripe for potential redevelopment came up for sale at the southeast corner of 23rd and Union. On Tuesday, a coalition of local developers and community groups closed a $23.3 million deal to buy the 2.5-acre block, where the MidTown Center strip mall is now located. It plans to build at least 520 apartments, about half of them affordable, subsidized units for lower-income renters. Notably, the community group Africatown — which buys land to help the local black community thrive culturally and economically — will own one-fifth of the block and develop at least 120 of the new apartments. It will reserve the housing for local residents earning as little as $27,000, with one-bedroom rents as low as $720 — less than half the cost of the typical Seattle apartment. Its mission has taken on more urgency as African Americans have dropped from 70 percent of the Central District’s population in the 1970s, to less than 20 percent now. By itself, the 23rd and Union project represents one of the biggest affordable-housing developments in the city, which is desperate for new subsidized rentals to help a growing group of residents getting priced out. A lottery in February for an income-restricted building in South Seattle drew 20 applicants per apartment. But the latest project is particularly noteworthy because of the unique way it’s organized. Typically, affordable-housing projects are built by nonprofits, often using public funds, while private developers sometimes include a small number of subsidized apartments in their regular, market-rate buildings in exchange for city approval to build taller. But the 23rd and Union plan puts a portion of the project under the ownership of the local community through what’s known as a community land trust. That guarantees the housing will be affordable permanently, and gives locals — including people living on site — direct power in how the building is operated going forward. The rentals will be the first of their kind in Seattle, though statewide, there are similar programs covering several hundred affordable houses for ownership. Backers of the 23rd and Union project hope their community-ownership plan will set a new model for other projects, both in the Central District and elsewhere. Already, residents in Little Saigon have inquired about launching a similar development in their neighborhood, where displacement is also an issue. Still, the number of new units included in the development represents a fraction of the need, and there are tremendous barriers to building more. For starters, there simply isn’t enough land. Doris Koo of the Yesler Community Collaborative, which was involved in the 23rd and Union coalition, noted that Mercy Housing last month received a $30 million grant from local billionaire Paul Allen to build housing for the homeless. “They’ve been knocking on doors saying, we have $30 million, where can we find land,” Koo said. And they’ve been unable to find anything, she said. 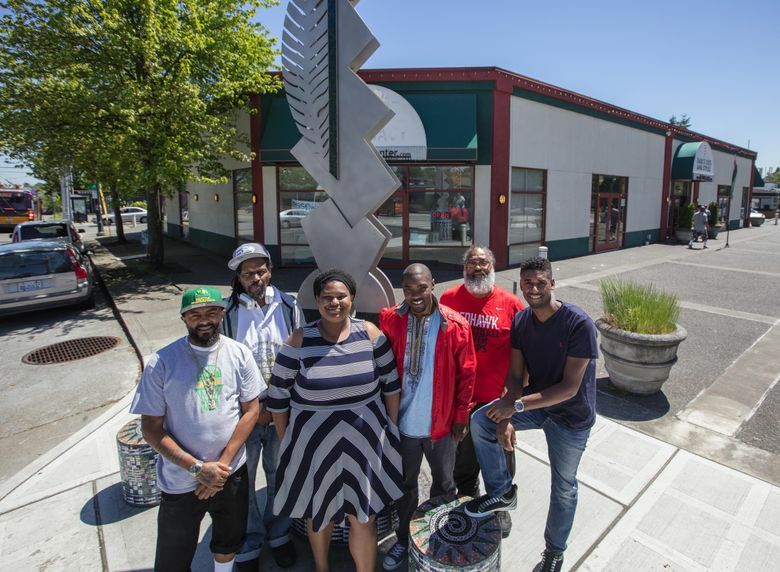 Another issue is funding: Africatown is getting its stake in the project through local land-conservation group Forterra. After previous deals for the property with private developers fell through, the two nonprofits bid on the property by themselves several months ago, and were rejected. They eventually joined with a private developer, Lake Union Partners. The partnership is able to use various tax credits that developers receive in exchange for building affordable housing. It also means Lake Union gets to build hundreds of market-rate units with more community buy-in. Even when a deal comes together, the local ownership model is no sure way to prevent displacement in a neighborhood — groups can’t simply reserve housing for certain people. Projects still must comply with fair-housing laws, meaning the affordable units built in the 23rd and Union complex will be open to anyone who has an income low enough to qualify for the lottery that determines who gets the units. Koo and Garrett said they hope to advertise the units heavily in the Central District in hopes of attracting people who have been priced out of the area or are in danger of being displaced, upping the odds of keeping longtime residents in the neighborhood. The development will include 125 units set aside for people earning 60 to 85 percent of the area median income, or $40,000 to $65,000 a year — with rents as low as $1,080 for one-bedroom. Another 120 to 135 apartments will be reserved for people making as low as 40 percent of area incomes. An additional 275 to 295 apartments would be rented at market rates. Lake Union Partners said it hopes to get approval to break ground in the next 18 to 24 months, and then construction would take up to two years. That would likely put the opening of the six-story building in 2021. The project was particularly complicated because the longtime owners of the land, the Bangasser family, has had disputes over the years between siblings in charge of the property. Previous deals to acquire the land for development fell through. But Lake Union Partners says this latest plan is real: County records show it closed on the acquisition of the property late Tuesday, unlike previous would-be buyers that planned redevelopments. And Lake Union has received full financing for the project, said Patrick Foley, a principal at the firm. The project is also noteworthy because of its location. The intersection, which on its other corners also holds the large Uncle Ike’s pot shop and other housing projects, has a long and complicated history. At just one building there, two consecutive business owners were murdered, in 2003 and 2008, and then when the third owner took over, the building was burned down in an arson in 2013. The intersection is also where community activist Omari Tahir-Garrett — the father of Africatown’s Wyking Garrett — hit then-Mayor Paul Schell in the face with a bullhorn during a neighborhood festival. Public and private investment in the corner in recent years has coincided with a drop in the drug dealing and violence that had plagued the area. “As the innovation economy began to grow, and the community didn’t grow with it, we saw the effects of displacement,” Wyking Garrett said. The map with this story was updated May 24 to change labels that incorrectly described the status of nearby projects.